← Weekly BLOG: What Was So Nice About Nice, France? Having waited so many years to finally make it to France, I can barely describe in full detail the excitement of seeing the Eiffel Tower for the first time. On the bus, riding over the River Seine in downtown Paris, spring afternoon, sun shining brilliantly…I stretched my neck to see what I was told would be coming into view. I could hear my voice above everyone else, “Oh, my God, there it is!” I could feel my heart racing with the happiness of a dream coming true at that very moment. It was a feeling of pure joy! The hotel room provided a partial view, but from the street in front of the hotel I could see the entire monument from a distance. That’s where, at 10 p.m. Paris time, having been awake for about 34 hours, I watched millions of twinkling white lights outline the Eiffel Tower. It was totally awesome and completely magical! I had a lump in my throat and tears in my eyes. I guess it was the sum of emotions stored in years of dreaming about it, and here is was, staring at the symbol of Paris with my own eyes. Pinch me; is it real? I also had a chance to go the tower and ascend in the tightly-packed elevator to the second platform. Not a fan of heights, I easily ventured to the edge and looked out. Check out my website at www.CWLauro.com to find out not only what I saw first, but also other photos and how we can make memories last. 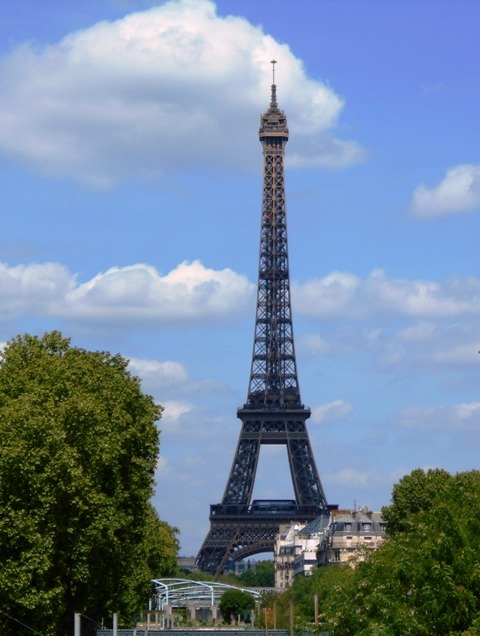 This entry was posted in Creating a Successful Life, Extraordinary Places and tagged Cathy W. Lauro, Eiffel Tower, living deeply, living in the moment, making memories last, Paris, Pure joy, Seine, successful living, The Inside Advantage, Touch a Heart with TIA. Bookmark the permalink.